Hello Franziska! Can you briefly introduce us to S.E. Yachting? Hello Marcella! Thank you for having us in your blog! James founded the company 16 years ago and now we are a young, creative and dynamic team speaking English, German and Spanish. Our office is in a prime location in the Marina Santa Eulalia. You have a unique and new "It's just about us" offer, which is very interesting for engagements and honeymoons! Can you tell us a little more about this special offer? 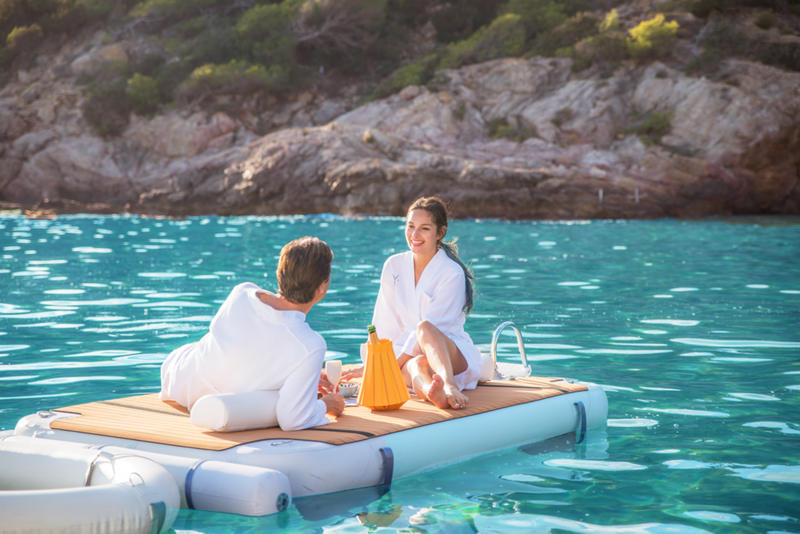 This year we are distributing the must-have for every yacht fan: inflatable platforms that float on the water. Like any of our products, my partner James and I always test them beforehand. While we were lingering on the platform, we notice that we are as close to the water as possible, and that THIS is pretty relaxing! We were in a quiet bay, just the two of us and relaxed in the super comfy sun loungers that are part of the platforms. This moment was so magical for us, the quietness and the togetherness, that we have been inspired to offer this romantic feeling for other couples. That moment was only about the two of us. And that's what counts in life, right? This feeling cannot be put into words and we can only tell: once you have tried the platform and experienced Ibiza above the water, you do not want to leave! We have named this unique offer "It's just about us" because that’s what it’s all about on that day. A wedding day is a lot of hustle and bustle - the family is there as well as many friends while you have barely time for just the two of you. The charter program is particularly suitable for honeymoons here on the beautiful island of Ibiza, because it (finally) invites you to relax, to start the future together in a beautiful way! When the big celebration is over, the yearning for relaxation, and maybe some detox, is preprogramed. Now the WE time begins! Wedding proposal: Floating on the water and the beautiful island at sea level in front of you is a very unique and romantic experience. A secluded bay, a dream setting and your favourite human is lying next to you on your floating "Private Island". Is there a more romantic moment to ask the question of all questions? We cannot guarantee that the answer is yes, but a special person deserves a special and unique wedding proposal. And we can definitely support that perfect moment. If you book one (or more) "Floating Spa Day" with us, we can assure you that every day is a unique experience. In comparison to a normal charter, where you celebrate in a large group on the boat to Formentera, we have set ourselves the goal of consciously choosing less crowded bays because there will not be much distraction by noisy boat neighbours. Depending on the weather, our skipper drives to a quiet bay in the beautiful north of Ibiza. As soon as the couple enters our boat, it's time to relax. Clothes are taken off and exchanged with a bathrobe on board and the We-Time begins. What is included for the perfect day for two? Do you have different menus and special highlights? 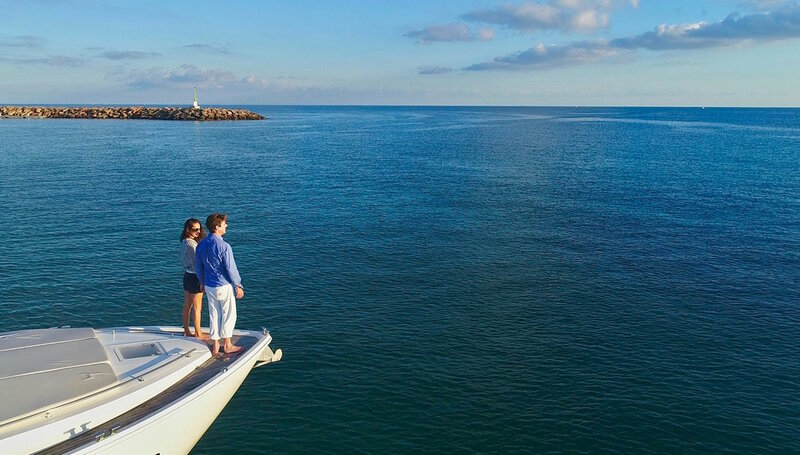 Our offer includes a 12m motorboat, a super emphatic skipper, a NautiBuoy platform with sunbeds, Wi-Fi, towels, bathrobes, gasoline and our S.E.Yachting Seabob with "floating garage" including a C-dock. Our package includes a delicious "Feel Good Menu" with soft-drinks and a bottle of champagne. The menus are changeable at short notice, in case of food intolerance, vegan or vegetarian or other special requests. In addition to our basic package, we also offer other menus, even sushi and other Asian specialties, as well as a detox menu. On board, selected wines and cocktails can be purchased. It is important to us that our guests feel comfortable and we are happy to customise food and drinks as desired or arrange flowers to make it as perfect as possible. The Seabob is included in the package because it’s quiet often the case, that one person is a little more active, while the other person loves to relax. 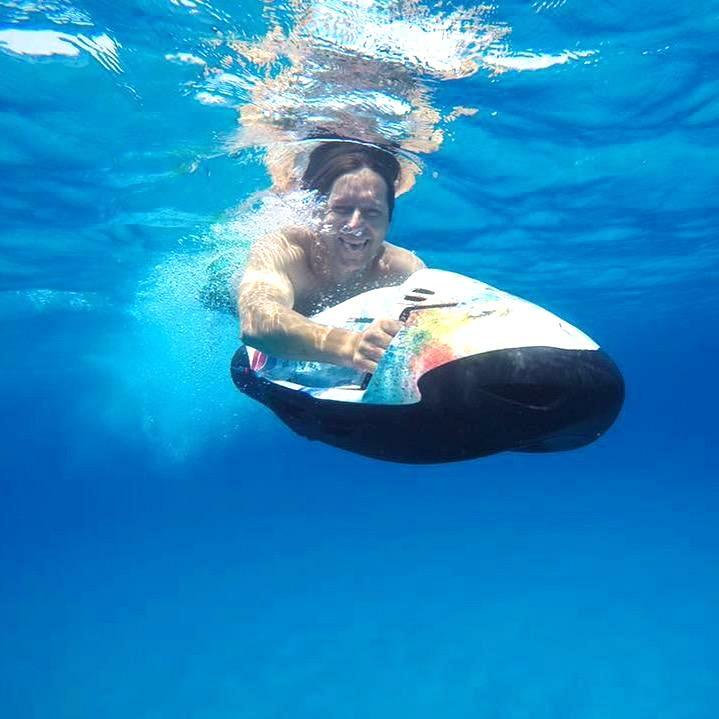 Our Seabob invites you to glide through the refreshing sea and explore Ibiza's underwater world – plus it’s a great work-out. Meanwhile, the other person can take a small power nap or take some amazing photos. A C-Dock will be provided to easily park the Seabob. You can also use the Seabob with the two of you. We have tried it ourselves and had a lot of fun! From when and until when can you book the "It's just about us" offer? 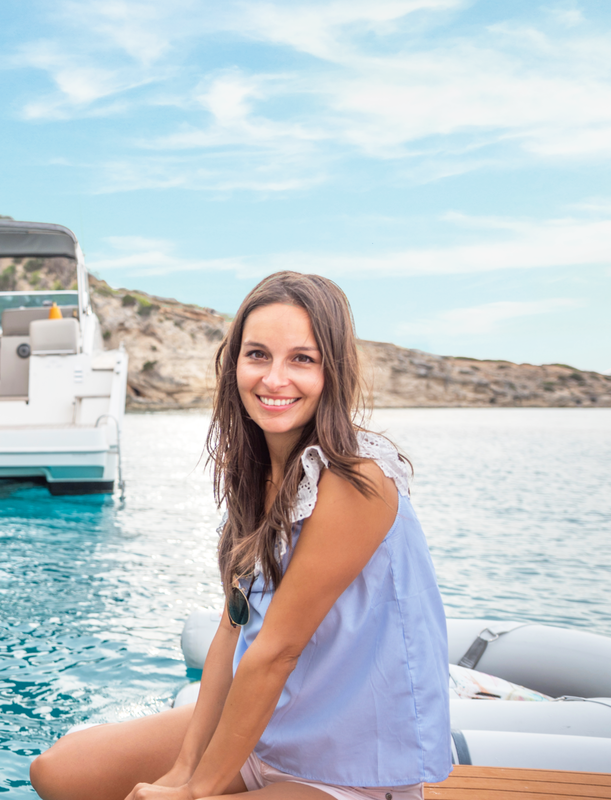 The couple meets us in our office in the Marina of Santa Eulalia and we guide them to the boat. Usually we start at 11am and return to the port around 7pm. But we are very flexible! It is of course also possible to experience a romantic sunset or to start early in the morning. "It's just about us" can be booked from April to the end of November. We also have extra warm hoodies for the colder months. Since I am also responsible for the interior design of the yachts, I have set up our boat with great attention to detail. So there is a lot to discover for all lovers of detail. Which boats do you offer for smaller groups? For example, to enjoy an engagement party or the days after the wedding? That's a nice idea! Because exploring Ibiza from the boat is really beautiful. So you can share these impressions with your closes family and friends. In our charter fleet we offer different sizes. Also "It's just about us" can be booked on larger boats. For example, we have a new 18m Princess Yacht in our program, which would be great in case 12m should not be enough. Otherwise this boat is suitable for 10 persons plus a crew of 2 persons. 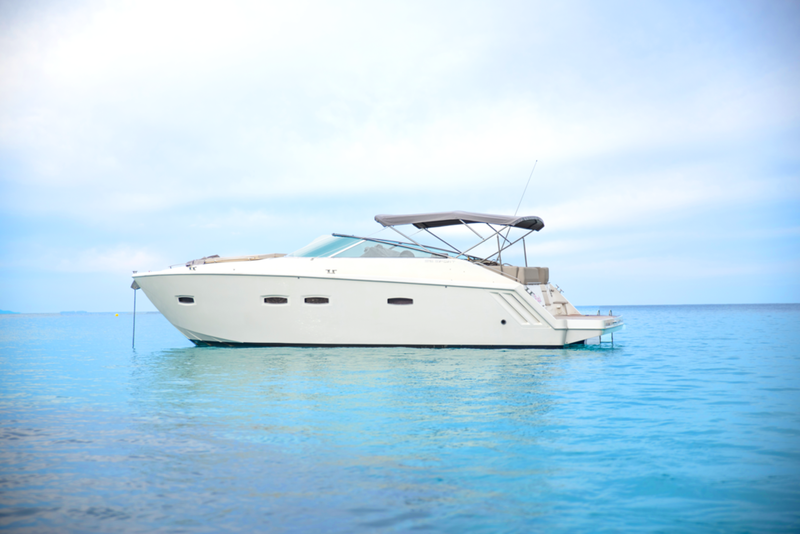 The largest motorboat with 27m in our fleet is designed for 12 people plus 3 crew-members.